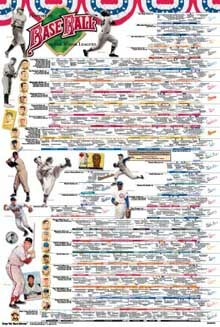 History of Baseball in the Major Leagues, all on one poster! Welcome to SPRING TRAINING YEARBOOK ONLINE. 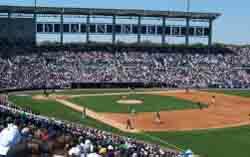 All the information that a spring training fan needs for enjoying the 2014 Cactus and Grapefruit League season -- schedules, ticket prices, contact numbers, suggested restaurants and accommodations, maps to each ballpark, travel time and distance between ballparks, spring training rosters for each team, current Grapefruit and Cactus standings and more -- is available at this site and will be updated regularly. For the 2014 season, we publish the complete spring training information online, at this site. Back issues of the printed magazine Spring Training Baseball Yearbook from 1988 - 2004 can be ordered here. PLEASE NOTE: No print version of Spring Training Baseball Yearbook will be published for 2014. Salt River Fields at Talking Stick, spring training home for the Diamondbacks and Rockies in Scottsdale, Arizona. SPRING TRAINING YEARBOOK ONLINE posts all the pertinent schedule, ticket, travel and inside information to keep fans completely informed about the Grapefruit and Cactus Leagues. Throughout November and December, each club, the league and the training sites release schedule and ticket information. As soon as it becomes available, you'll be able to access it here. SPRING TRAINING YEARBOOK ONLINE is your complete guide to Baseball's exhibition season and Spring Training camps. Complete schedules for the 15 Grapefruit League teams in Florida and 15 Cactus League clubs in Arizona are listed. We also provide large color maps to show you how to get to each ballpark. Through the years, SPRING TRAINING has published a collection of history articles dealing with Spring Training. An index of these are listed under History. 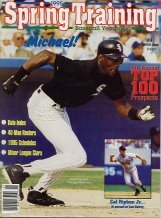 All Back Issues of SPRING TRAINING are still available for purchase, including the 1995 edition featuring Michael Jordan on the cover. You may order one or all of these. Note: Only games against other major league teams are included.